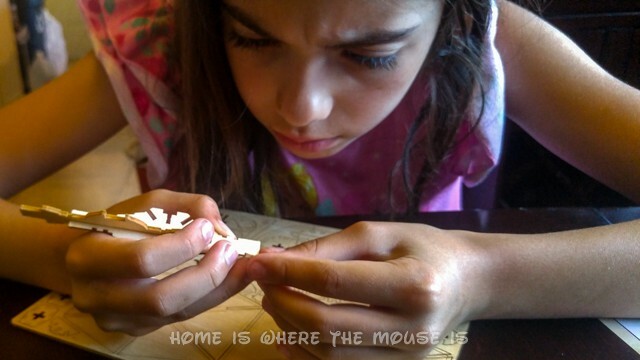 Model Building is a fun activity for the entire family, but it can be challenging as well. 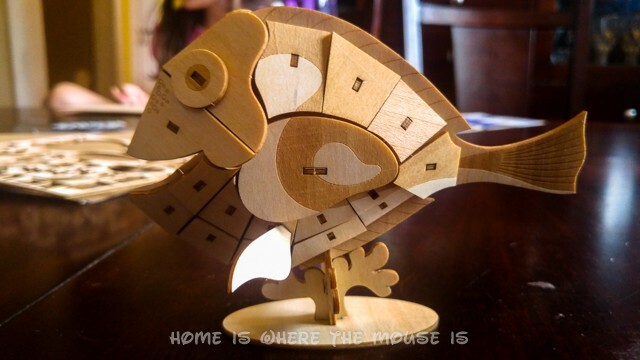 However, you may not believe that you or your kids have the patience or skill to put together a model. You would be wrong. 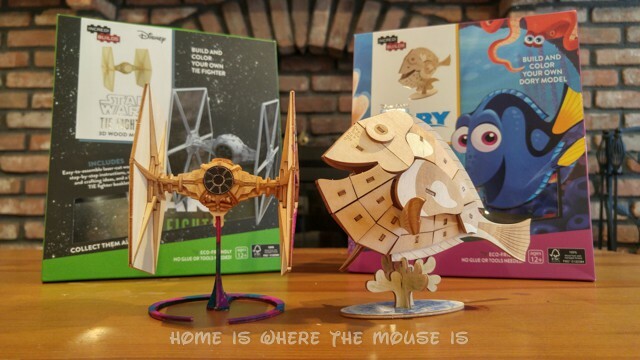 IncrediBuilds has the answer with “do-it-yourself, customizable, freestanding models that are sure to delight fans of all ages.” They were kind enough to send us a few to try out. We had a great time putting them together, even if it wasn’t quite as easy as they claimed. 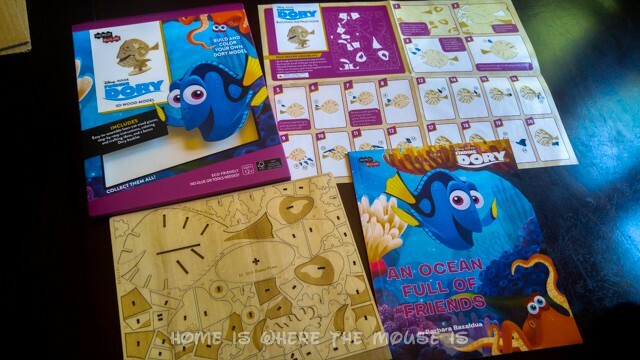 IncrediBuilds are 3D wood model and book kits developed by media publisher Insight Editions. Here’s a video from their website. They look amazing, right? It’s certainly a cool idea. I love that each model has a book that comes with it. The CEO of IncrediBuilds said the whole idea was to bring books to life and inspire creativity. 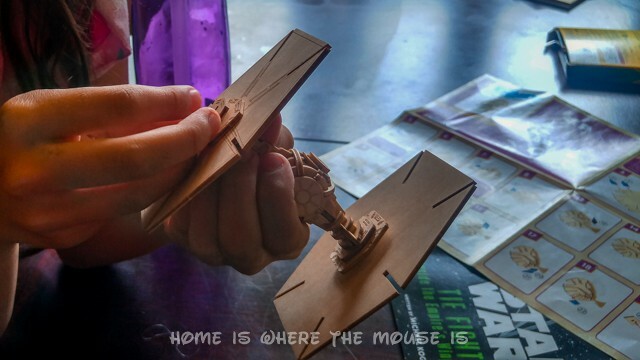 Each model is designed so that the laser-cut pieces fit together without the need for any glue! 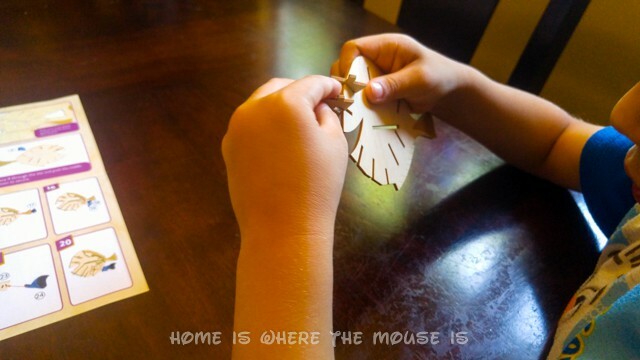 It’s a great craft project for kids! Needless to say, I was excited when our model kits arrived. I wanted to put these together as much as the kids did! The boxes for the model kits are slim. They were only 1/2 inch thick, and about 9 inches tall by 7 3/4 inches wide. It was hard to believe that everything we needed to build a 3 dimensional model was inside! First, we opened the boxes and laid out what was inside. Each box contained a wood sheet with all the pieces, an instruction sheet, and a booklet. Each model also has a skill level. These skill levels aren’t noted anywhere on the box. 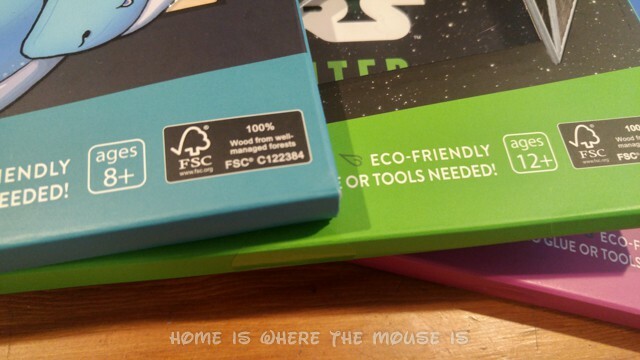 I found them only by looking on their site. I’m guessing the skill level depends on the number of pieces. Two of the “Easy” models are age 12+, while one of the “Intermediate” is age 8+. One of the “Advanced” models is age 10+. It’s a little confusing. The age level might be based on the reading level of the booklet. The age requirements didn’t matter to the kids. 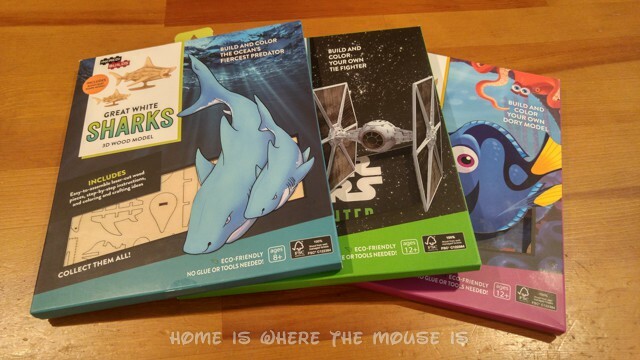 Bella chose the “Star Wars” TIE Fighter (12+) and Jackson chose Dory from “Finding Dory” (12+). The Great White Sharks (age 8+) might have been more appropriate for Jackson given that he’s only 5. It is also two separate models. I could have done the adult, and he could have done the baby. He really wanted to put together Dory, though. We took a quick look at the booklets before getting started. 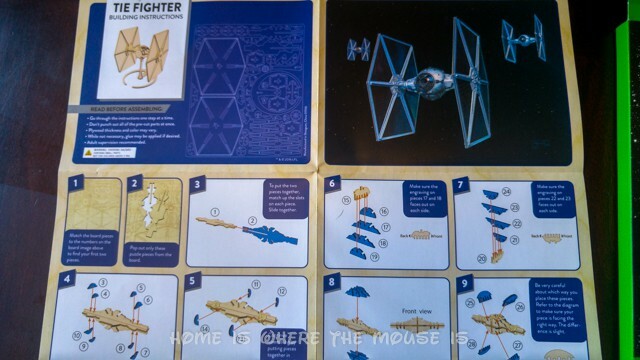 The TIE Fighter booklet is a “Star Wars” geek’s dream. It’s full of information on the ship, pilots, and technical specifications. 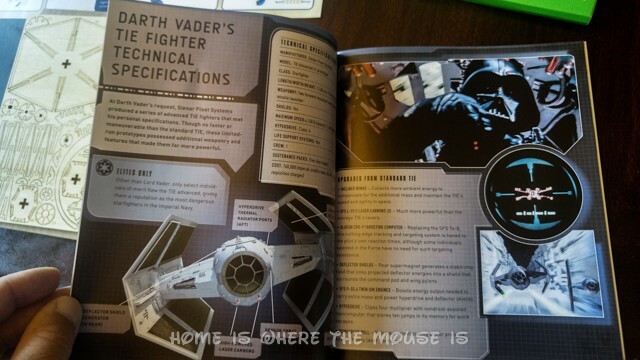 It also includes artwork and behind-the-scenes information from the movies. I was getting sucked into it! 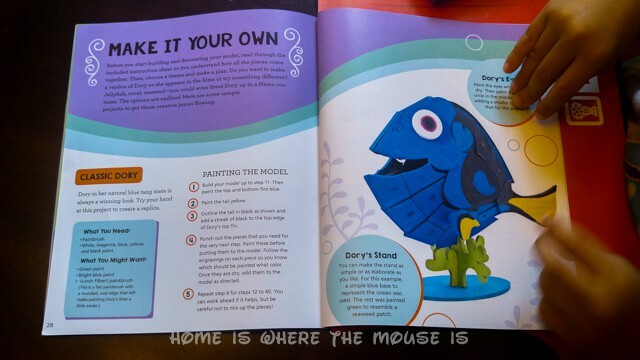 Next, we took a look at the Finding Dory booklet. It follows the story line of the movie and has information about all the sea creatures the characters meet along the way. It’s full of animated images as well as photos of actual sea life. Bella could probably read these books on her own, which occasional help for certain words. She’s an above-3rd-grade-level reader. Jackson enjoyed the pictures, so even younger kids can enjoy the books. Lisa wants to steal the books for her students. Both booklets have ideas for how to customize the models using paint, markers, or colored pencils. The kits do not include supplies for decorating. 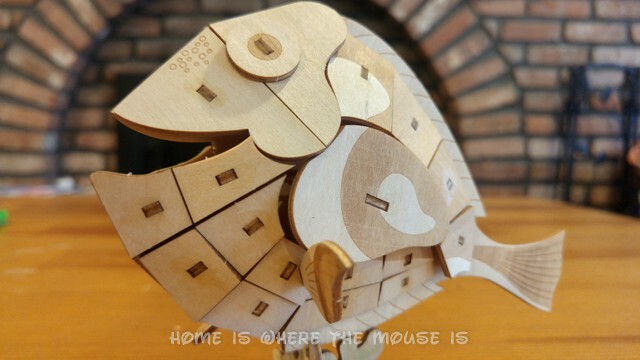 Each model came with 1 wooden sheet that included all the pieces you need for the model. 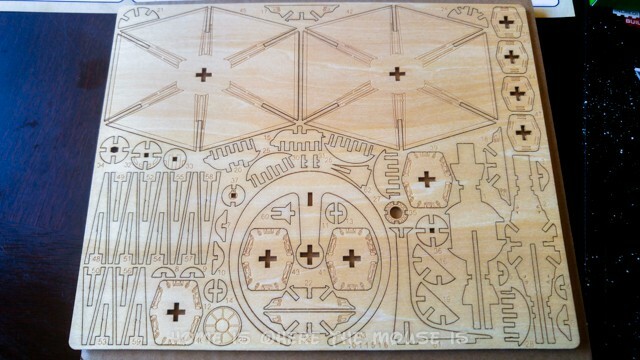 The pieces are laser cut, and should only need to be punched/popped out using your fingers. Each piece has a number next to it, but they are not laid out in any particular order. The Dory pieces came out easy, enough. In fact, a couple of pieces fell out right when we took it out of the box. 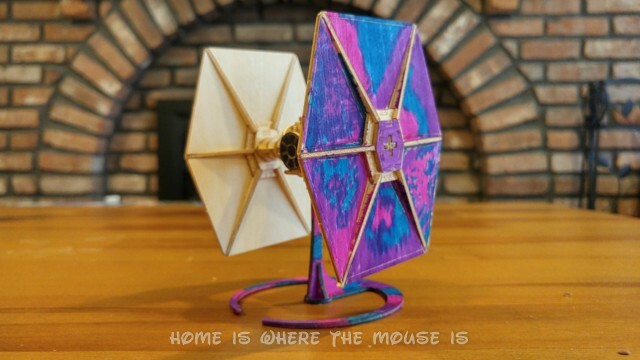 The TIE Fighter pieces were a different story. The step-by-step instructions were on a folded sheet of glossy paper. The pieces needed in each step were numbered so you can find it on the sheet. There is even an image of the sheet with pieces outlined and numbered to help you find them. This was helpful a few times. I was comfortable letting Bella get started on her own model while I worked with Jackson on his. Jackson was interested for about 10-15 minutes before he got bored. 5-year-olds! I started getting frustrated at about this time. That might be why Jackson lost interest. The pieces weren’t staying in place. I would get one side of Dory done, only to have the pieces fall off from the other side. So much for not needing glue! With each setback I would look over to see how Bella was doing. Her TIE Fighter was coming along slowly. The big challenge for her was getting the tiny pieces out of the sheet. Even with her slender fingers, it was tough. So, she created a punch-out tool from a paperclip to help. On my side, I finally got Dory completed and nervously placed it on the stand. Jackson came back to see the finished product. 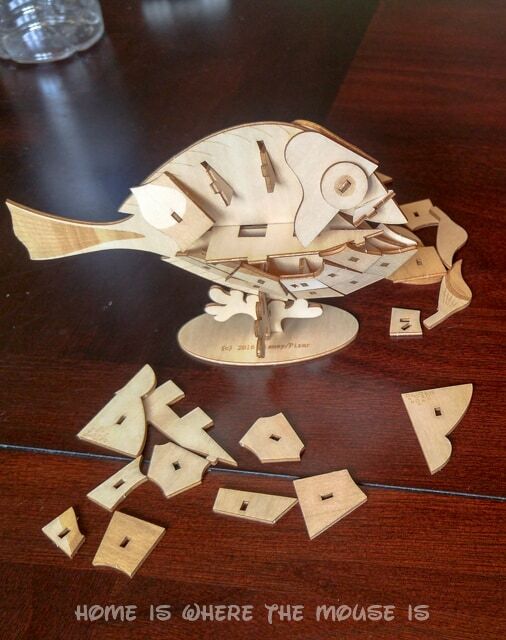 He loved his Dory model, until he breathed on it and it fell apart again! UGH! I decided that glue was actually necessary for that one, and put aside the pieces for later. Then I moved over to help punch out the pieces for Bella as she needed them. She was right, the tinier pieces were difficult to get out, and I actually broke a couple trying. Thankfully, the damage was slight and the pieces were still usable. Bella and I finished the TIE Fighter and it turned out pretty well. She did a great job overall, and only needed to ask for help once or twice. I found that some of the pieces could have been pushed in further than she managed. The two tiny pieces for the laser cannons that broke would need to be glued to stay on. After building, it was time to decorate! Bella came up with a design plan for the TIE after looking through her booklet. She is going with a Tye-Dye look. I like that she was able to give the model her own personality. I can just imagine a stolen “TYE Fighter” in a Star Wars movie being flown by Rebel Pilot Bella! We couldn’t decorate Jackson’s model because the glue needed to dry. (I used some Aleene’s Max Tacky Adhesive I bought at a local craft store). It looks pretty good without any decoration, though. The kids and I had fun with our IcrediBuilds Models. There is no doubt about that. Bella definitely got more out of it, as she built the model mostly on her own. She also understands how delicate it is. Jackson wants to play with his as if it was just another toy. 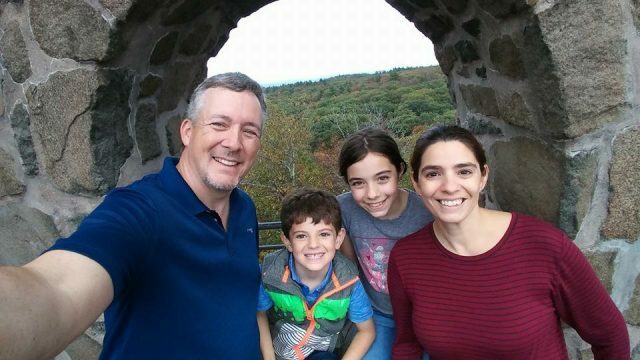 IncrediBuilds are marketed as easy-to-build. You shouldn’t need glue or tools. 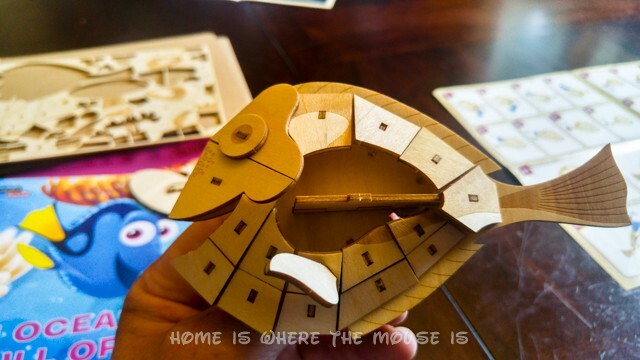 This was not the case for us, especially with the Dory kit. 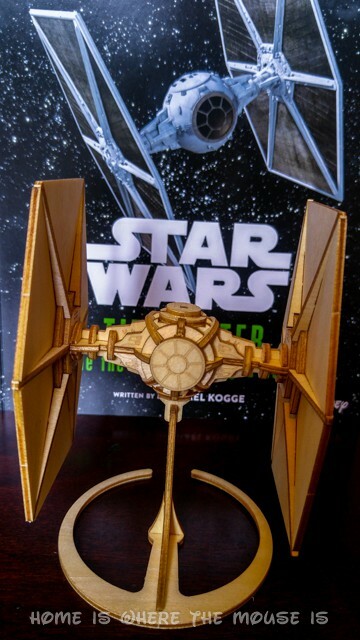 The TIE Fighter probably could have avoided glue altogether had we been more careful punching out the tiny pieces. But that was no easy chore. I wouldn’t hesitate to try my hand at another model from IncrediBuilds. Overall, I think it’s a good product. I wouldn’t just hand one to my kids, though. At their ages, it requires some supervision and assistance. That does make it a great opportunity to do something together with them! I can’t wait to do another. I’ll also have my glue handy, just in case. The IncrediBuilds website doesn’t have a storefront, but you can look on Amazon, Bam!, and Barnes & Noble. 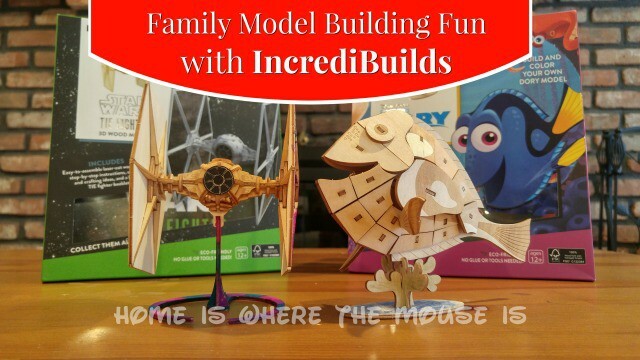 IncrediBuilds has Star Wars, Disney, Harry Potter, Animals, Monuments, and more when it comes to models you can choose from. It might be hard to decide on just one!